A group of tender perennial plants, only one of which is commonly grown. This is Strelitzia Reginae, which has large ornamental leaves on long strong petioles (leafstalks), and bears brilliant orange and purple flowers, several together within a large bract, on stems 3 ft. or more high in spring. It is a native of South Africa and belongs to the Banana family, Musaceae. The name commemorates Charlotte of Mecklenburg-Strelitz. A Remarkable Plant. This is one of the most remarkable of exotic flowering plants and is magnificent when in full bloom. It thrives in a greenhouse in which a minimum temperature of 50-55 degrees is maintained, and may either be grown in large flowerpots or in a prepared bed of soil on the floor of the greenhouse. The plants must be exposed to the sunshine and free ventilation is needed during warm summer weather. At that season the plants require a good deal of water and the soil must be kept moist; in winter the soil should be watered only when it is fairly dry. Planting may be done in autumn or early spring. The most suitable soil consists of loam, two thirds, with one third of peat and leaf mold, and a free scattering of sand. 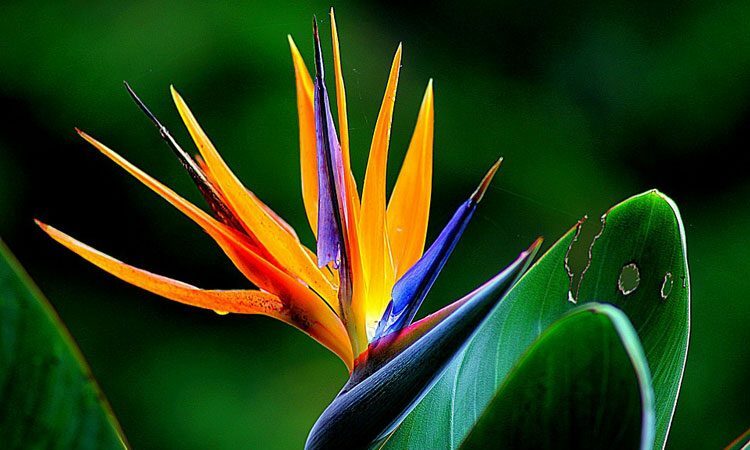 If Strelitzia is grown in a bed of soil, care must be taken that it is well drained. If the plants are grown in pots, those 7, 8or 9-in. wide are suitable. Early spring is the best time to repot those plants which need this attention. Outdoor Culture. In climates where little or no frost occurs, as in parts of California and Florida, Strelitzias may be grown outdoors. They thrive in any good soil and need liberal amounts of water during their season of active growth. Established plants benefit from an annual application of fertilizer. A mulch of compost or other organic material is of benefit. Propagation and Kinds. The simplest way of increasing the stock of Strelitzia is to detach the small side shoots, or offsets, when the plants are repotted. If seeds can be obtained, they should be sown in a warm greenhouse in pots of sandy soil in February or March. In addition to S. Reginae the following kinds are sometimes cultivated: S. augusta, which has a distinct trunk and attains a height of 18 ft., flowers white; S. kewensis, a hybrid between S. Reginae and S. augusta that is intermediate in appearance between its parents and has pale yellow flowers with lilac-pink markings at the bottoms of its petals; S. Nicolai, similar to S. augusta but usually larger and with the inner segments of the flowers blue instead of white; S. parvifolia, like S. Reginae a trunkless kind, 3-4 ft. tall, flowers purple and yellow. All, except the artificially produced hybrid, S. kewensis, are natives of South Africa.